Nubar has given us two matte options for this fall- first, Nubar V For Men (which acts as a matte topcoat) and now a set of four matte polishes. I'm not really one to care about trends, but wow, the matte trend is huge this year. Avant-Garde. A unique russet. Unique russet is the manufacturer's description and I'd say it fits this shade quite well. It's a reddish, brownish, coppery type of color that just screams fall. It has a ton of shimmer that looks awesome matte as well as glossy. Contempo. A classic red. This is a bright, glamourous red shimmer. It has kind of a retro-glam Old Hollywood look to it. It's a very noticeable color. The rich shimmer in it is accented by gold particles. Prevail. A spectacular purple. This is a really gorgeous shade. It's a deep, dark brownish purple. Purple with touches of gold. Very dramatic. Vital. A deep wine. It's described as wine, but it's really quite purple. I'd say it's a little more reddish in real life. This is also a shimmer like the other shades in this collection. I mentioned that they looked as good glossy as they do matte... Here's proof! Don't these look fantastic with a glossy topcoat? If you're not crazy about mattes but still like the color, you have options! Take these for example. They dry matte, but if you want glossy, just add a topcoat like Nubar Diamont Shine. If you change your mind and want to go back to matte, just add a coat of Nubar V For Men. Or you can go partially matte, partially glossy by doing a french tip with either matte or shiny topcoat, or using matte or shiny topcoat to Konad a design on top. The formula on these is great. Smooth, even-textured, easy to control, not too thick. I didn't have a single problem with the formula. These mattes are much more forgiving than the other mattes released so far this year. The reason for this is that they don't dry as fast. With other mattes, they start to dry as you are applying them. These stay wet during application which allows room for error. The drying time is still super fast, totally dry within about five minutes, but you have a little more time to work with them, which is to your advantage. These mattes aren't quite as matte as some of the others. They are still matte- not a hint of gloss- by they are more smooth and satiny. They don't really have that chalky ultra-matte look. I know not everyone likes the super-matte look, so these would suit your taste if you want matte but not ultra-matte. These are really the entry-level mattes- perfect for someone who wants to try out the matte trend but doesn't have any experience with matte polish. Overall, I really like these. They're easy to work with and apply yet they still dry quickly. I'm not totally enthusiastic about the shade selection- while I do like them, they are rather tame and traditional- red, copper, dark purple, wine. I suppose that's not really much of an issue because Nubar also offers a matte topcoat so I can mattify any shade I want. You should see Nubar V on top of Nubar Greener... spectacular. I'll post a picture when I do my Nubar V review, you'll love it. 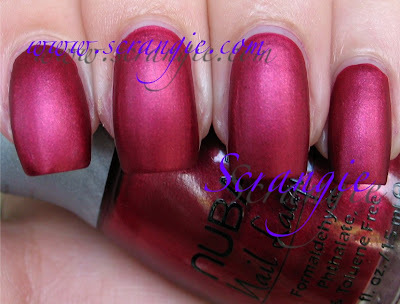 Nubar's Modern Matte collection can be purchased directly from Nubar's website. They're currently sold as a set for $24.95, but I'm sure they'll be available separately in the future. You can always email customer service to find out for sure. Wow, these look awesome! Thanks so much for sharing them with us. I am still not excited about the matte trend, but I think I would like to try a matte top coat to mattify (sp?) my current polishes instead of going out and buying a bunch of matte polishes (I need to save my $ for some of the new fall lines)! I can't wait for your post on those! I also REALLY like the idea of mixing matte with glossy! Ok, these may be the Mattes that I end up purchasing, because it's so much closer to what I was hoping for. Thanks for the pics! Denette, you're welcome! I hear there will be more mattes/matte topcoats than I originally thought too! Sprinkles, yeah, sorry about that :( Hoping it will encourage people to just credit me instead of trying to steal and cover it up! Edelmc, thanks! 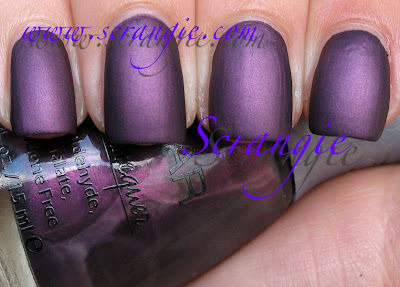 I actually used Seche Vite in these photos. I mostly use Seche Vite, it dries the fastest and is shinier than any other topcoat I've used. I'm not convinced of the health risks, that warning is basically there so they can sell it in California... But if you are concerned, try Nubar's Diamont Topcoat, it's really, really good (not as shiny or quick drying as Seche) and big three free. Love them, I can't wait to do swatches on them. They look fab! And of course you make them look great! OMG!! those are soo pretty! I want them! Prevail is beautiful, both matte and shiny. It's calling me! I've just taken the plunge and ordered my first matte - the grey Zoya (the name escapes me right now). They've only just come out over here and I didn't want to feel like I was missing out on the matte party! Just stunning! Beautiful nails and colors. sigh. I definitely need Prevail and Avante Garde. These are spectacular colours, and I love that you show them glossy too...those who are afraid of mattes, this gives you an option. What I love is the depth of the colour and the pigmentation. They look fab on you as always! Thank You SO MUCH for having such an awesome blog! It is great to see the polishes on your nails before I go out and buy. 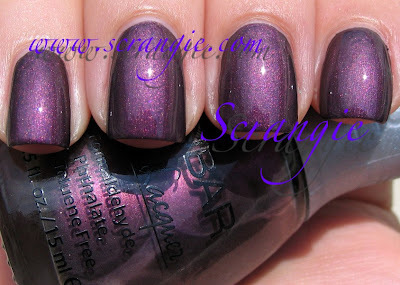 I love the purples in this Nubar series! Might just buy the kit and give away the reds. I am so glad you're back. I was worried that the thieving episode made you reconsider your blog. Wow, so pretty! I love these purple mattes. 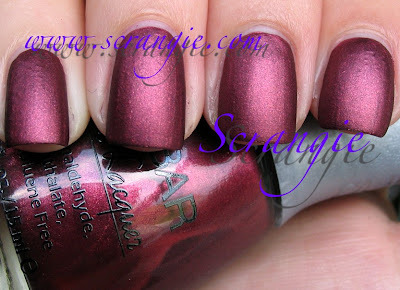 Is Contempo comaparable to Zoya's Posh? The two reds look rather similar to me. doing a french or konad with topcoat is a really good idea! I hope someone does that to see what it looks like!!!!! Beautiful swatches as always!This is my favourite matte collection so far. 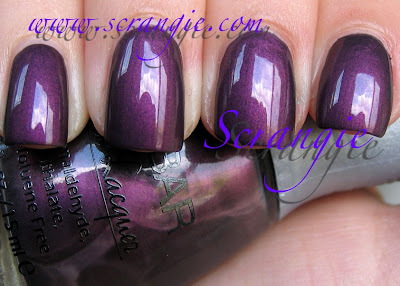 Scrangie, your swatches are awesome. Thank you *so much* for the time and effort you invest in this blog. Ooohh...can't wait to check out your swatches of a mattified Greener! I just bought Nubar V and Greener (among other Nubar polishes). Good timing! So far I'm really impressed by this brand. Hi, a while back you posted screen shots of the LA Girls Disco collection...I was wondering if you'll have swatch of those? I bought all of them the day they came out and they are absolutely gorgeous! I love that they don't have that chalky finish; they are more satiny. I love these mattes! They look gorgeous on you. I almost ordered them yesterday. These shades are pretty and I also love them with the Seche. I have a quick question for you if you don't mind...? Which matte top coat do you think is the best out of Orlys or Essies Matte about you? I currently don't own any matte polish at all, and have been thinking of buying a matte top coat before ordering a bunch of matte polishes to see if I like it. Wow Scrangie, you've done it again - managed to introduce us to yet another 'new' look. I really like the semi-matte look you show here vs. the full matte like Man Glaze. I'm headed to get some Nubar matte-V for Men! Scrangie, you have managed to do it again - wowed us with another 'new' look! I really like the semi-matte look like these example vs. the full matte like Man Glaze. I'm headed to get some Nubar Matte-V for Men! Your nails look awesome. How do always manage to paint them so perfectly? Wow, I can't believe how huge this trend seems to bee, every brand seems to be making a collection (or two as OPI) of mattes, suedes, satins etc. I'm almost on the verge of getting tired of this... But I won't, I love mattes! I just did a many with the contrasts matte/glossy, sooo gorgeous! Trying to get into matte and its just not happening, Prevail with a glossy top coat is gorgeous tho'! 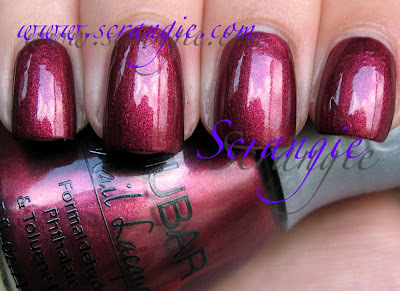 Judging by the pics I've seen so far, Nubar seems to be the best matte out there. You should post how Greener looks like with the matte topcoat!!! Great pics as always -thank you! Seriously. You could sell frostbitten fingers to people climbing Mt. Everest! Anything you put on your nails makes me want to buy it, and I don't even like matte n/p! I do like the idea of matte top coat, however! Thanks for another awesome post! I think that out of all the matte collections, this one is my favorite!! Love the colors and the bit of shimmer in each finish! big thumps up from me and thank you Scrangie for sharing! I love them! Just wondering, can you think of a dupe for Prevail, matte or not? I'd really appreaciate it!